The Skeletal Mesh Simplification Tool lets you create a lower-resolution version of the original mesh. The mesh updates in-place so you can see the results instantly in the editor's viewports as you tweak the quality level of the mesh. The original mesh data is preserved, allowing you to tweak the mesh to your desired level of quality without losing the original source mesh. Additionally, the tool can be used to automatically create level-of-detail (LOD) models for the mesh. These LOD models will be swapped in at a distance where the lack of detail is less noticeable. As these LOD models have less vertices and may require fewer bones they can result in a significant increase in rendering performance. During simplification the skeleton is preserved so that all animations continue to work with the simplified skeletal mesh. Note: Currently morph targets and alternate bone weightings are not supported for skeletal mesh LODs that have been simplified. See the MeshSimplificationTool page for information on simplifying static meshes. 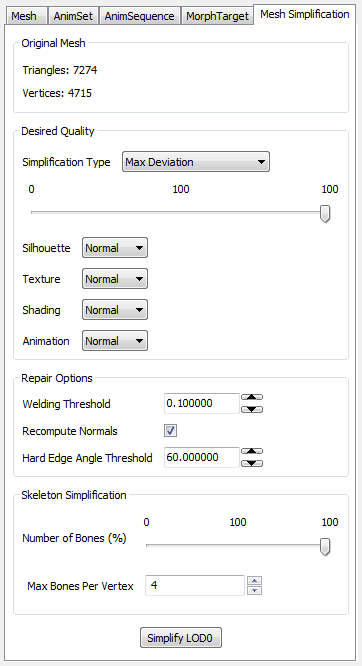 Select your desired simplification settings and click the Simplify LOD button. The mesh will be immediately updated in both the AnimSet Editor and other editor viewports. Max Deviation The maximum deviation from the base mesh as a percentage of the bounding sphere. The editor uses the desired quality to compute an error metric for the mesh. This error metric prevents the tool from simplifying a mesh such that the surface of the new mesh deviates too much from the surface of the source mesh. The advantage to this approach is that the tool can intelligently optimize the mesh within some deviation of the source mesh without stopping at an arbitrary triangle limit. Number of Triangles The editor simplifies the mesh until it has the exact number of triangles specified. Silhouette. Specifies how important the silhouette of the mesh is. You can choose from Off, Lowest, Low, Normal, High, and Highest. Choosing a higher setting will cause the simplification to better preserve the geometric shape of the mesh but will result in a higher triangle count. Texture. Specifies how important texture density is. You can choose from Off, Lowest, Low, Normal, High, and Highest. Choosing a higher setting will cause the simplification to avoid texture stretching artifacts but will result in a higher triangle count. Shading. Specifies how important shading quality is. You can choose from Off, Lowest, Low, Normal, High, and Highest. Choosing a higher setting will cause the simplification to better preserve shading quality but will result in a higher triangle count. Animation. You can select how important animation is. You can choose from Off, Lowest, Low, Normal, High, and Highest. Choosing a higher setting will cause the simplification to avoid animation artifacts but will result in a higher triangle count. Welding Threshold. Vertices within this distance from one another will automatically be welded. This can help to eliminate small faces. Using large values can produce undesirable results. Recompute Normals. If true, the smoothing groups will be recomputed based on the simplified geometry. Otherwise, smoothing groups will be retained from the original mesh. Hard Edge Angle Threshold. When recomputing normals, angles larger than this value between faces will result in hard edges between faces. Smaller angles will create soft egdes. Number of Bones. The ratio of bones that are mapped to vertices in the simplified LOD mesh compared to the original mesh. Lower values result in more bones being removed from the mapping. Max Bones Per Vertex. The maximum number of bones that can be assigned to each vertex in the simplified LOD mesh. The triangle, vertex, and chunk counts will update in the upper-left corner of the AnimSet Editor viewport when you simplify the mesh. The triangle and vertex counts of the source mesh are displayed in the Mesh Simplification tab so that you may compare them to the simplified mesh. You may continue adjusting the quality settings and simplifying the mesh until you arrive at a result you are happy with. The mesh simplification tool can also generate an LOD for you. 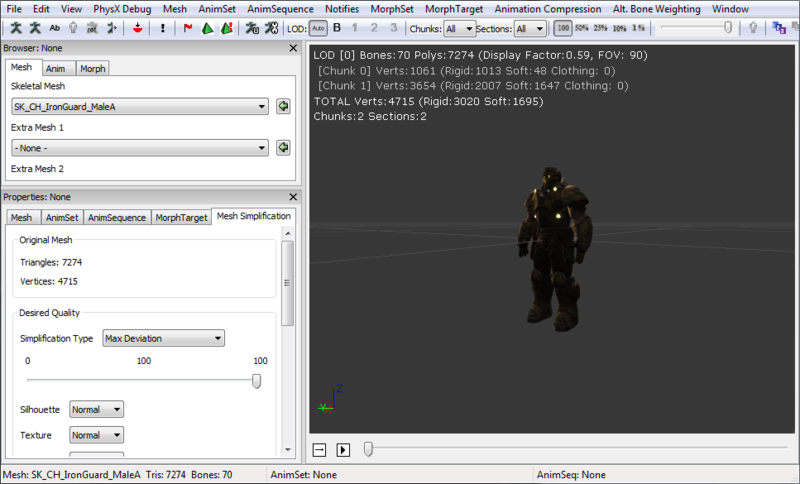 In the AnimSet Editor select Generate LOD from the Mesh menu. Select the distance at which you wish to swap in this LOD, then select how many pixels the LOD is allowed to deviate from the source mesh. Finally, click OK to generate the LOD. The editor will compute the quality metric for you when generating an LOD. 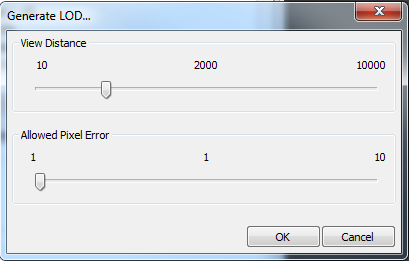 The allowed pixel error tells the editor how many pixels you're comfortable with the mesh popping at a given distance. As an example, if you set the distance to 2000 and the allowed pixel error at 1, then the generated LOD will not deviate by more than 1 pixel from the source mesh when viewed from 2000 units away. This computed metric is an approximation. It makes some assumptions about the size of the backbuffer (1280x720 is assumed) and the field of view (90 degrees is assumed). This approximation is meant as a starting point from which you can fine tune the quality of the generated LOD. When an LOD is generated in this manner the editor will automatically set the Display Factor for the LOD so that the LOD is swapped in at the distance you chose when generating it. After generating an LOD you will probably want to tweak its quality. Simply follow the instructions for simplifying a mesh and make sure you select the LOD that you generated. Simplygon is used to automatically generate game-ready Level of Detail models (LODs) for a specific pixel resolution by removing as much information as possible without degrading LOD quality for a certain onscreen size. Simplygon uses a proprietary mesh reduction method that retains geometrical LOD integrity and visual quality of LOD switching, producing AutoLODs that can directly be used inside triple-A games. Unreal Engine 3 leverages Simplygon to provide high-quality mesh reduction without having to leave the Unreal Editor. Developers can quickly simplify meshes, generate LODs, and immediately see the results in their maps.